Late last year, Capcom announced that Geralt of Rivia, the main character of CD Projekt Red’s The Witcher series, would be coming to Monster Hunter: World as a guest character. The White Wolf will be arriving, silver sword in tow, on February 8 on PlayStation 4 and Xbox One as part of a free update. Notice I said guest character and not skin. Unlike some of Monster Hunter: World’s other crossover events, like Aloy from Horizon or Ryu from Street Fighter, Geralt is not just your hunter wearing a costume. 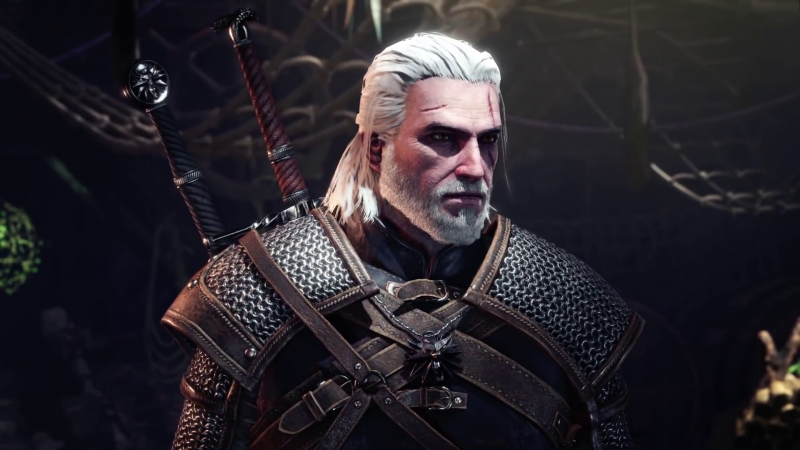 Capcom hasn’t fully detailed him yet, but they said they have been working with CDPR for quite a while on this meeting of worlds, going as far as getting Geralt’s silken-voiced actor to record new lines for the game. Might we be hearing Geralt exasperatedly bemoan that Bazelgeuse is interrupting his hunt again? We can only hope so. There’s no word on when the Witcher update will hit PC, as Capcom still keeps the console and PC versions on staggered schedules. All platforms are participating in the Monster Hunter: World Appreciation Fest later this month, however, starting January 26. Capcom hasn’t detailed what that will entail, but they will likely celebrate the one-year anniversary of the game with new gear and a return of every time-limited quest again. Monster Hunter: World is available on PlayStation 4, Xbox One, and PC.